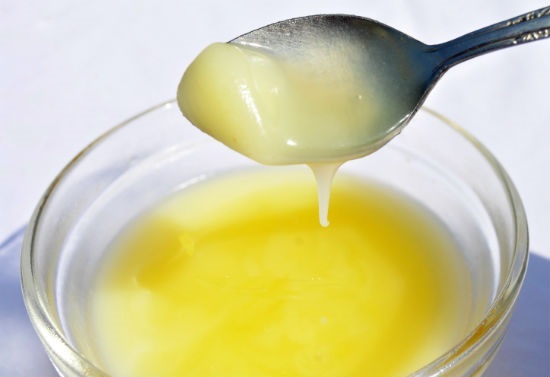 Ayurveda recommends regular consumption of Ghee in one’s diet to stay healthy and fit. It is very helpful in enhancing vitality, improving complexion, fertility etc. Ghee is known to contain fat soluble vitamins which are essential for a fit body and sharp brains. There are various Ghee brands in India which promise good quality product to make your living healthier. In fact, it is the most important ingredient of Indian cuisine which makes it so lavish and rich in flavors. Most of the Indian houses prefer using cow’s organic ghee which is considered to be the best. This article brings to you the concise information on the best ghee brands in India which are en epitome of quality and purity. These are the hot selling brands in the market which offer amazing health benefits. Patanjali Cow Ghee is one of the best brands for authentic granule ghee in India. It is prepared from the fats of cow’s milk. It is an exclusive product from the famous brand of Baba Ramdev which promises high quality standards and purity parameters. It is highly nutritious and can be used for cooking food and sweets along with application on rotis and paranthas. This cow ghee also contains the finest formulation of nutrients like vitamins, PUFA and MUFA. Amul Ghee is one of the most popular ghee in India. It ranks high on purity and quality standards. It is a great source of energy for body. You can use it for application on rotis and paranthas along with cooking vegetables and garnishing dals. It is also apt for preparing sweets. It is rich in vitamins and contains granular texture. It has an amazing aroma and is made using fresh cream. There are different variants offered by Amul which is the most promising brand for ghee and butter in India. Amul Ghee, Sagar Ghee and Amul Yellow Cow ghee are other variants. Organic India Desi Ghee is made with pure cow’s milk. It is prepared with fresh milk using the traditional methods. The cows are kept in a healthy environment and are nourished in the healthy surroundings. They are given healthy fodder which is produced in the farmlands of the company to ensure the best diet. All the nitty-gritty is kept in mind so that the cows product milk rich in quality which is prepared in the best ghee. This is surely the most trusted brand in India where the minutest things are kept in consideration to bring out the healthiest ghee. Milkfood Pure Ghee is the hot-selling ghee in India. It is the most widely sold ghee. It is made from the finest butter, rich in nutrients; which is clarified under precisely controlled conditions. Over the years, this brand has become the favorite of many Indian households. The beautiful pure aroma and the granular texture of the ghee reflect its quality and richness. It is an ideal medium to prepare food and make it tastier and richer in flavors. This is another very popular brand of ghee in India. It offers various variants which fall under certified organic grassfed ghee which is prepared from non-homogenized milk. It is prepared while keeping in mind the quality standards and purity parameters to ensure that the healthiest and richest source of energy is produced for the customers in India. From simple regular ghee to spice ghee, you can shop for your favorite variant and enjoy a wholesome diet with this amazing brand. Namaste India Ghee is another very popular brand in India. It is prepared from the rich and pure milk of cows and buffaloes. It comes in granular texture and is rich is various fat soluble vitamins like A, D, E and K. It is a wholesome diet which multiplies the taste of your dishes. It is as good as the homemade ghee which is wonderfully rich in aroma and taste. It is one of the hot selling brands in the local markets. Hatsun Cow Milk is a healthy ghee brand in India. It is a popularly used ghee in the India households. It is prepared with the richest milk collected from various dairy farms where they are raised in the best of the environment. The good health of the cows results in great quality. This is one of the purest ghees which can be used in preparing food and add more taste to your food. These are surely the most promising ghee brands in India which guarantee quality and taste. You can enjoy richer, healthier diets by including these most popular brands in your food. Eat healthy and live happily. We are find the one of the product – desi ghee – Namasty india whose stibilized at Kanpur – UP.